Yes, that’s the work of Max Weber she decided to pluck off my shelf and thumb threw. After a good long rest, sipping on her water cup, and bored of Pound Puppies, she decided to explore a German sociologist from the turn of the 20th century. I mean, who wouldn’t, right? I couldn’t help but chuckle. 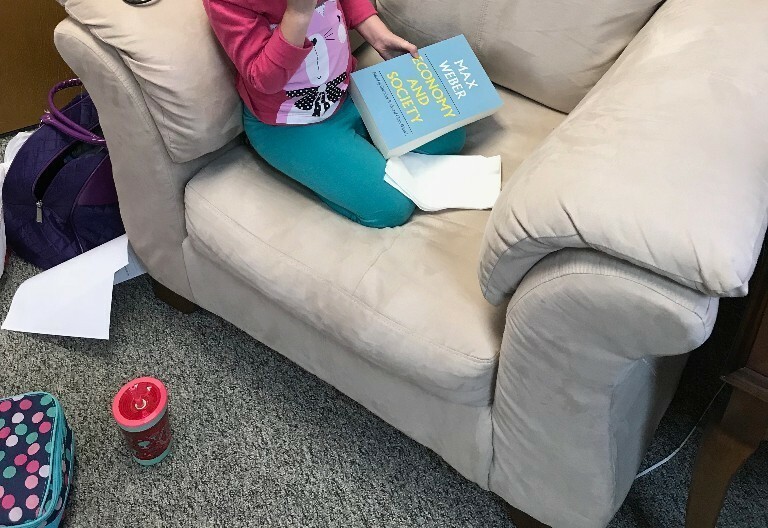 After asking about the book in her hand (and taking this photo as quick as my my fingers would let me), I learned she likes big books. Daddy’s office is a treasure trove of pages, words, and colorful covers. My heart leapt. She loves books! And not just Dr. Seuss! One day, perhaps, she’ll explore Weber on her own, and learn about his thesis of “dis-enchantment.” In the ancient world, life was “alive” with spirits, forces, and divine agents. But now our bureaucratic, scientific society has, by the power of rational discipline applied to every facet of life, removed this mystical quality of existence. Disenchantment is positive if superstitions are dethroned (no, earthquakes are not divine retribution; they are seismic shifts in tectonic plates). It is negative if life loses it’s moral and spiritual luster and drives us toward meaninglessness. Loneliness. Meaninglessness. Exhausting, endless routine. I think we long to be enchanted. We might call that our thirst for meaning and mystery. Perhaps you’ve experienced those flat, dull seasons of life when you long for something more, something magical, something bigger than you that makes the world shine with meaning and purpose and hope. There is so much in our world that promises (and cleverly markets itself) to do just that. It’s no secret we long to be enchanted. And there’s money to be made in manufacturing enchantment for us. That’s what we’ll be exploring this Sunday as we engage the spiritual movement from Illusion to Prayer and return to the biblical story of Elijah. 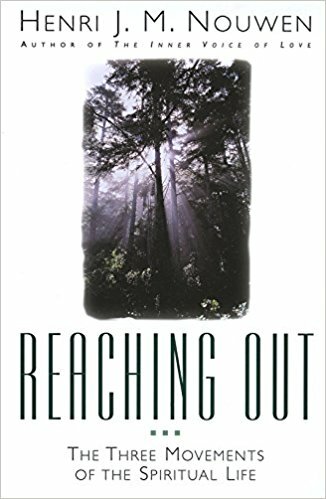 PS – the January sermon series leans and builds on the book Reaching Out: Three Movements of the Spiritual Life by Henri Nouwen. In addition to this book resource, you can reflect on the sermon and scripture–either personally or in small group discussion–using a Reflection Guide available for download from the South Elkhorn website here.